Books – For a comprehensive overview of a topic, books commonly provide a broader, deeper, more-well rounded treatment than journals and other forms of scholarly communication. Research Data – All information, in whatever form, collected during the research The true raw material associated with any prestigious research project. Patents – Providing full disclosure of all details of an invention, patents are a fundamental component of the world’s body of published scientific An essential source of technology, but also a wealth of pure scientific information. Web of Science (WoS) is a respected academic publisher best known for providing unique source of citation indexes and metrics. After careful negotiations based on UCF’s current subscription on Web of Science, Incites (JCR) and Endnote, WoS is offering the Citation Connection at a discounted rate for $87,827 to be competitive in the UCF Technology Fee process. In addition, WoS also will include the current data of all these citation indexes with no additional cost in our current WoS subscriptions, making this one-time purchase even more exceptional. These additional citation indexes provided by Citation Connection on Web of Science offer unique features that make it easy to link and bring together the various resources, e.g. journal articles, books, data, proceedings and patents that are often spread in a wide range of sources in pieces. The Citation Connection on Web of Science will be available to all UCF students, faculty and staff anywhere, anytime, 24×7. It will also benefit UCF Regional Campuses, online courses, and distance education programs. Students and faculty will be able to discover the content by searching the Web of Science interface directly, which is available from the Databases page on the UCF Library Homepage. The content will also be exposed in the subject databases and Library Research Guides. All content and features will be accessible through Web of Science’s user-friendly interface that provides options to browse by collection, institutional affiliation, or author. The results are easily exported to various file formats that are friendly for the users to manage. Web of Science will allow fair use of the content for educational purposes, including embedding links into WebCourses and Canvas. Access would be available to all UCF students and employees, with off campus access enabled by Shibboleth authentication. Based on the indexes covered in Citation Connection, we have identified the programs and colleges that are likely to benefit the most from the purchase of these collections. Students at upper level undergraduate and graduate levels will particularly benefit from this purchase. A combined enrollment of 30,790 is listed in details in the table below. In addition, the 2,256 UCF faculty will find Citation Connection invaluable to their teaching and research needs. The table below shows the UCF student that will directly benefit from the purchase of Web of Science’s Citation Connection. Maintenance of this collection requires a small annual platform fee that is typical for digital collections of this quality. UCF Libraries will fund this annual fee from existing funds. All content and functionality associated with Web of Science will be hosted by Web of Science, so there will be no new demands on UCF staff or infrastructure. Citation Connection on Web of Science will add a large collection of citations, exposing scholarly landscape that is difficult to locate otherwise. Unlike typical library resources which tend to include the full text of journal articles, books and documents. Web of Science provides references to these scholarly content, connects various sources through citations in a single interface, and produces analytics that measure the impact on research output. WoS specializes in citation indexing, enabling researchers to trace the evolution of a research topic through “topic” search, and to outline the influence of one publication or author on other articles, books and items through “work-cited” search. WoS includes analysis tools to track the citation counts for articles and authors, resulting in a single interface to find analytics that measure the impacts on research outputs and highlight the achievement of the UCF scholarly community. The collections selected for purchase closely align with UCF courses, especially those on the graduate level or upper level undergraduate studies where more intense research are assigned. It is one of the best single-resource to uncover various researches output on a topic to form a comprehensive research idea, which can be critical for any grant proposal development by students and faculty. Students in social sciences and STEM disciplines can discover the references to data going back to 1900, which typically are difficult to identify. Similarly STEM students will gain access to references to patents from the Derwent Innovation Index dated from 1963. Equally exciting is that the citations to books and conference proceedings will be added by the purchase, which should benefit students and faculty in social sciences and humanities. Citation Connection will also expand the analytics provided by our current subscriptions on Web of Science, highlighting students and scholarly with high impact and high productivities compared to peer universities. They would benefit (AMPAC, NSTC, and MSE) undergraduates as well as graduates who are taking a number of methods classes (e.g., EGN1111 and EMA6111), or working to increase their methods competencies (e.g., the undergraduate projects held annually). This will help the current faculty. 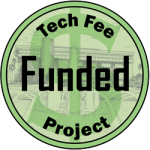 the tech fee proposal that is being considered. The materials acquired would benefit industrial engineering undergraduates and graduates who are taking a number of methods classes, such as Industrial Engineering , for example, a required course for all industrial engineering Ph.D students, or students who are working to increase their research capabilities. In addition, it would directly support the research of industrial engineering Ph.D. students and department faculty. One new WOS feature seems particularly promising: Citation Connection. Whereas many of our faculty and students are familiar with the use of Google Scholar, Citation Connection offers connections to conference papers, books, and more in a single search. As the acquisition budget permits, I hope you will consider adding this resource to our collection. I am pleased to write this letter of support for the tech fee proposals, which will add an important database to the Web of Science database collection – Citation Connection. I believe that Web of Science materials would be a very useful addition to library resources as part of the tech fee proposal that is being considered. They would benefit Civil, Environmental and Construction Engineering undergraduates as well as graduates who are taking a number of methods classes (e.g., CCE4404 and CWR5515), or working to increase their methods competencies (e.g., the undergraduate projects for the Interdisciplinary Display for Engineering Analysis Statics (IDEAS) event held in CECE Department annualy). This proposal addresses a need for faculty and students to access critical information for grant proposal development, manuscript preparation and dissemination, and student projects. Specifically, the web of science citation Connection is comprised of a number of specific resources from Derwent for Patents to the Data Citation Index, to BIOSIS. The Web of Science employs a common classification system that enables users of all levels of expertise to take advantage of these powerful resources. The Citation Connection on the Web of Science will also expose students to the complete landscape of scholarly output. The platform provides students with the opportunity to understand ways multiple forms of scholarly communication can be woven together to complete a comprehensive picture of a research idea. By linking research through citing pathways students will see how different forms of scholarly output play specific roles in the world of research. As a researcher and professor at UCF I give my full endorsement and support for UCF to acquire this much needed platform. The UCF Libraries is committed to work directly with faculty and students, e.g. College of Graduate Studies, Faculty Center for Teaching and Learning to publicize these materials. The Libraries will offer informational materials to distribute during various events, such as the Faculty Development Conferences. In addition, librarians will instruct students about Web of Science, including Citation Connection, during Information Literacy sessions. Citation Connection on Web of Science will benefit faculty by providing content for faculty research and content for course assignments. The UCF Libraries will measure the success of Citation Connection on Web of Science through reports and satisfaction surveys. COUNTER reports (an industry standard format for online usage statistics) will track the number of searches and result clicks in a standardized format. Selected faculty and students will be asked for comments these products. Because of its unique content and different interface, it is expected that Web of Science will increase by 3% to 10% per year in the first three years. The content in Citation Connection is unique and not available otherwise. It is expected that students and faculty will find the content highly useful. After implementing the Citation Connection, the UCF Libraries will provide training on the use of the content through a host of outreach opportunities to both students and faculty. The subject librarians will collaborate with the academic programs and units identified aforementioned to promote it. Bibliographic instruction sessions, face-to-face reference sessions, one-on-one research consultations and LibGuides will all be used to promote the collection and provide needed instruction. In addition, selected faculty and students may be asked for comments for qualitative assessments. The Libraries will annually measure the success of the Citation Connection through COUNTER usage data provided by Web of Science administrative site. The annual usage reports are included in the Libraries’ Annual Report and will serve an important benchmark. In order for achieve meaningful quantitative assessment, a 3-year time series comparison will be conducted three years after the full implementation of these resources. The requested funds will cover the entire cost to purchase the Web of Science Citation Connection. In addition, the current citations on all the indexes included by the Citation Connection will be automatically rolled into the general Web of Science subscription. The Libraries will maintain links and support access. Any recurring costs for maintenance of the collection will be paid for using library funds. All content and functionality associated with Web of Science will be hosted by Web of Science, so there will be no new demands on UCF staff or infrastructure. The requested $86,827 in technology fee funding combined with the $1,000 UCF Libraries cost share will cover the entire purchase of Citation Connection from Web of Science. The cost per student simultaneously served is estimated $2 ($87,827 / 30,790 = $2) based on the students directly benefited. However, this price per student could be misleading because faculty and other students can access the products for unlimited times. Over time the cost per use could be much lower. Web of Science is eager to participate in the UCF Technology Fee process and therefore offered this one-time cost of $87,827 for the purchase of Citation Connection. In addition, UCF will gain access to all the current content covered by the various indexes, making this an exceptional offer.